Princess Viktoria was born on 7 August 1862 at Karlsruhe Palace, Baden. Her parents were Grand Duke Frederick I of Baden, and Princess Louise of Prussia. Viktoria was named after her aunt, Crown Princess Victoria of Prussia. Princess Viktoria married in Karlsruhe on 20 September 1881 Crown Prince Gustaf of Sweden and Norway, the son of King Oscar II of Sweden and Norway and Sofia of Nassau. From then on, she used the name Victoria. The German Emperor and Empress were present at the wedding, and marriage was arranged as a sign that Sweden belonged to the German sphere in Europe. The marriage was popular in Sweden where she was called "The Vasa Princess", because of her descent from the old Vasa dynasty, and she received a very elaborate welcome on the official cortege into Stockholm 1 October 1881. On 1 February 1882, Victoria and Gustaf visited Oslo, where they were welcomed with a procession of 3,000 torch bearers. She and Gustaf were brought together by their families and their marriage was reported not to have been a happy one. Their marriage produced three children. In 1890–1891, Victoria and Gustaf travelled to Egypt to repair their relationship, but it did not succeed, allegedly due to Victoria's interest in one of the courtiers, and she repeated the trip to Egypt in 1891–1892. After 1889, the personal relationship between Victoria and Gustaf is considered to have been finished, in part, as estimated by Lars Elgklou, due to the bisexuality of Gustaf.She suffered depression after the birth of her first child in 1882, and after this, she often spent the winters at spas abroad. She would continue to spend the winters outside Sweden from that year until her death. By 1888, her winter trips had made her unpopular, and she was described as very haughty. In 1889, she had pneumonia, and was formally ordered by the doctors to spend the cold Swedish winters in a southern climate. She had conflicts with her parents-in-law about her expensive stays abroad. She greatly disapproved of the marriage between her brother-in-law prince Oscar and her lady-in-waiting Ebba Munck af Fulkila in 1888. She is described as strong-willed and artistically talented. She was an accomplished amateur photographer and painter and she also sculpted. On her travels in Egypt and Italy she both photographed and painted extensively, and experimented with various photo-developing techniques, producing high-quality photographic work. She was also an excellent pianist and, for example, could play through the complete Ring of the Nibelung by Wagner without notes. She had had a good music education and in her youth she had turned the notes on court concerts for Franz Liszt. Her favourite composers were Schubert and Beethoven. She was also described as a skillful rider. Victoria became Queen-consort of Sweden with her father-in-law's death on 8 December 1907. As queen, she was only present in Sweden during the summers, but she still dominated the court. She arranged the marriage between her son Wilhelm and Grand Duchess Maria Pavlovna of Russia in 1908. She was also devoted to various kinds of charity, in Sweden, Germany and Italy. Queen Victoria had substantial political influence over her husband, who was often considered pro-German. In 1908, Victoria made an official visit to Berlin with Gustaf, where she was made an honorary Prussian Colonel: she was described as strict and militant and it was said that she had the heart of a Prussian soldier. She was very strict with discipline, and if any of the member of the palace guard forgot to salute her, he was generally put under arrest. Swedish court life was also dominated by a certain stiffness, upheld by her favoured lady in waiting, Helene Taube. She was deeply conservative in her views and resented the dissolution of the Swedish-Norwegian union (1905), the Great Strike of 1909, the 1911 election victory of the radicals and the Socialists as well as the liberals, and when her son was temporary regent in 1912, she warned him in letters from Italy that he should not be too "intimate" with the elected government. Queen Victoria lost much popularity among Swedes for her often noted pro-German attitude, particularly politically during World War I when she is said to have influenced her husband to a large extent. During World War I, she gave a personal gift to every Swedish volunteer to the German forces. She kept up a close contact with the German emperor, whom she often visited during the war She founded "Drottningens centralkomittée" ("The Queen's Central Committee") for defence equipment. She deeply resented the social democratic election victories in 1917 and worked to prevent them from taking part in the government. Victoria's political influence was founded upon the power position of her first cousin, German Emperor William II, and in 1918–19, after he was deposed, she lost all political influence in Sweden. Queen Victoria suffered from very poor health (much due to poor treatment by several doctors in her youth), and often went on trips to make her health better (she suffered from bronchitis and possibly tuberculosis). She was treated with mercury and undue heavy medications during her difficult pregnancies, possibly the cause of her chronic conditions. From 1892 to her death, Axel Munthe was her personal physician and recommended for health reasons that she spend winters on the Italian island of Capri. While initially hesitant, in the autumn of 1901 she travelled to Capri, arriving to an official welcome and a crowd which escorted her from the Marina Grand to the Hotel Paradise. From then on, except during World War I and for the last two years of her life, she spent several months a year on Capri. After some time, she decided to purchase her own residence on Capri, an intimate rustic two-story farmhouse she named Casa Caprile, which she had extensively landscaped, surrounding it with a dense park. In the 1950s, twenty years after her death, the property became a hotel. The Queen went to Munthe's residence, the Villa San Michele, most mornings in order to join Munthe for walks around the island. Munthe and the Queen also arranged evening concerts at San Michele, at which the Queen played the piano. They also shared a love of animals, with the Queen frequently being seen with a leashed dog, and she was known to support Munthe's (eventually successful) efforts to purchase Mount Barbarossa for use as a bird sanctuary. It was rumoured that Munthe and the Queen were lovers, but this has never been confirmed. Queen Victoria spent a lot of her time abroad because of health reasons, as the Swedish climate was not considered good for her, and during her last years as queen, she was seldom present in Sweden: she participated in an official visit to Norrland in 1921, a visit to Dalarna in 1924, and to Finland in 1925. The visit to Finland was her last official appearance as queen; although she did visit Sweden at her husband's birthday 1928, she did not show herself to the public. During those celebrations, however, someone noticed the figure of a woman behind a curtain in the Royal Palace of Stockholm: he waved to her, and she waved back with her handkerchief. After this, she left Sweden for Italy for good: she died two years afterwards. She was the 855th Dame of the Royal Order of Queen Maria Luisa. 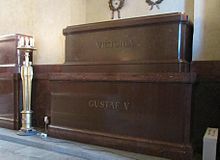 The grave of King Gustaf and Queen Viktoria in Riddarholm Church. Toward the end of her life, with her health declining, Munthe recommended she no longer spend time in Capri, and she returned to Sweden for some time, building a Capri-styled villa there. She then moved to Rome. Her final visit to Sweden was on her husband's 70th birthday in June 1928, and Queen Victoria died on 4 April 1930 in her home Villa Svezia in Rome aged 67. At the death of her childless brother Grand Duke Frederick II of Baden in 1928, Queen Victoria became heir to her great-grandfather King Gustav IV Adolf of Sweden, who had been deposed in 1809. The unrelated House of Bernadotte had been elected to the Swedish throne in 1810, and had reigned ever since. Victoria's son, King Gustaf VI Adolf, could therefore claim to be the heir of the Holstein-Gottorp and the Vasa as well as the Bernadotte kings of Sweden. "Before we reached the camp we came across a long string of beduin women in their long blue dresses." Photo: Queen Victoria of Sweden. Egypt, 1890. ^ Lars Elgklou (1978). Bernadotte. Historien - eller historier - om en familj [Bernadotte. The history - or stories - of a family.] (in Swedish). Askild & Kärnekull Förlag AB. p. 128. ISBN 91-7008-882-9. ^ Lars Elgklou (1978). Bernadotte. Historien - eller historier - om en familj [Bernadotte. The history - or stories - of a family.] (in Swedish). Askild & Kärnekull Förlag AB. p. 129. ISBN 91-7008-882-9. ^ Lars Elgklou (1978). Bernadotte. Historien - eller historier - om en familj [Bernadotte. The history - or stories - of a family.] (in Swedish). Askild & Kärnekull Förlag AB. p. 133. ISBN 91-7008-882-9. ^ a b c Lars Elgklou (1978). Bernadotte. Historien - eller historier - om en familj [Bernadotte. The history - or stories - of a family.] (in Swedish). Askild & Kärnekull Förlag AB. p. 161. ISBN 91-7008-882-9. ^ Lars Elgklou (1978). Bernadotte. Historien - eller historier - om en familj [Bernadotte. The history - or stories - of a family.] (in Swedish). Askild & Kärnekull Förlag AB. p. 131. ISBN 91-7008-882-9. ^ Lars Elgklou (1978). Bernadotte. Historien - eller historier - om en familj [Bernadotte. The history - or stories - of a family.] (in Swedish). Askild & Kärnekull Förlag AB. p. 140. ISBN 91-7008-882-9. ^ a b Lars Elgklou (1978). Bernadotte. Historien - eller historier - om en familj [Bernadotte. The history - or stories - of a family.] (in Swedish). Askild & Kärnekull Förlag AB. p. 162. ISBN 91-7008-882-9. ^ Lars Elgklou (1978). Bernadotte. Historien - eller historier - om en familj [Bernadotte. The history - or stories - of a family.] (in Swedish). Askild & Kärnekull Förlag AB. p. 160. ISBN 91-7008-882-9. ^ Lars Elgklou (1978). Bernadotte. Historien - eller historier - om en familj [Bernadotte. The history - or stories - of a family.] (in Swedish). Askild & Kärnekull Förlag AB. p. 163. ISBN 91-7008-882-9. ^ Lars Elgklou (1978). Bernadotte. Historien - eller historier - om en familj [Bernadotte. The history - or stories - of a family.] (in Swedish). Askild & Kärnekull Förlag AB. p. 164. ISBN 91-7008-882-9. ^ a b Lars Elgklou (1978). Bernadotte. Historien - eller historier - om en familj [Bernadotte. The history - or stories - of a family.] (in Swedish). Askild & Kärnekull Förlag AB. p. 165. ISBN 91-7008-882-9. ^ Lars Elgklou (1978). Bernadotte. Historien - eller historier - om en familj [Bernadotte. The history - or stories - of a family.] (in Swedish). Askild & Kärnekull Förlag AB. p. 166. ISBN 91-7008-882-9.